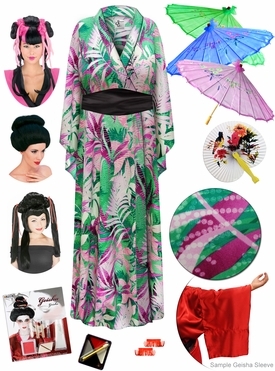 Planning to be a Plus Size Geisha this Halloween? Inspired by popular movies like Memoirs of a Geisha or the famous opera Madama Butterfly, this Beautiful Plus Size Geisha costume and kit will be perfect! With this costume you'll have all the accessories you'll need! Our geisha robes & caftans are wonderful! The fabric is a wrinkle-free washable poly blend! Each robe has long, wide, Geisha style sleeves and comes with a black sash! 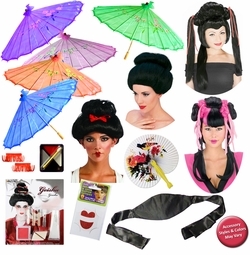 Add a Geisha Wig from $9.99 to $19.99!! Just click here to add flip flops! 1x/2x- Chest:48" Hips:48" Bottom Hem:50"
3x/4x- Chest:54" Hips:54" Bottom Hem:56"
5x/6x- Chest:64" Hips:64" Bottom Hem:65"
6x/7x- Chest:72" Hips:72" Bottom Hem:74"
8x/9x- Chest:79" Hips:79" Bottom Hem:81"